When we started this blog two years ago, one of our goals was to share all the different ways you can decorate and arrange similar spaces, especially Del Ray’s signature rowhouses and bungalows. We’d love to know what you are working on in your homes — do you have a room you are in the middle of decorating? How do you overcome design challenges? Have you finished a room and want to show others what you have done? Email us at info[at]diydelray.com and let us know! 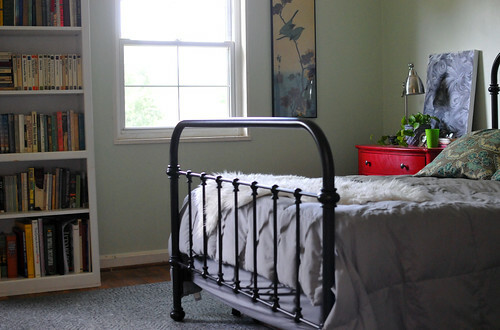 Today I’m sharing a room I’m currently working on, my master bedroom. Since I bought my rowhouse almost ten years ago, I’ve never been happy with how the master bedroom looked. 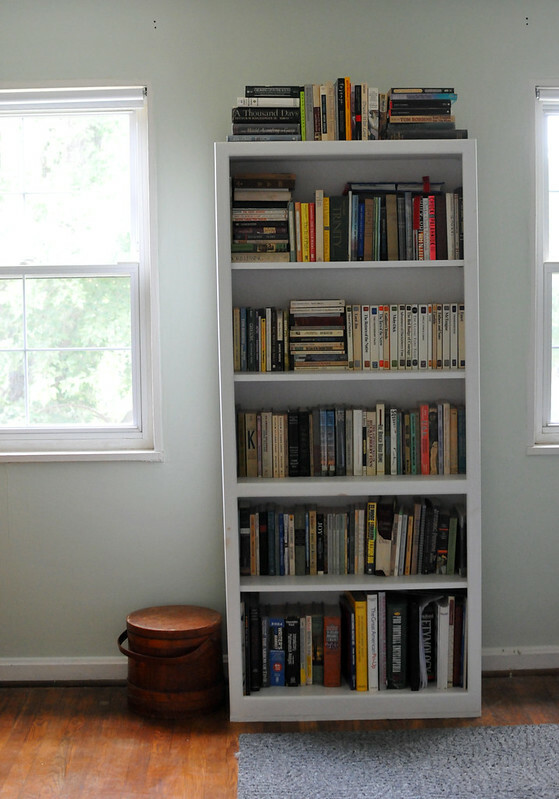 It’s kind of a mish-mash of various pieces of furniture collected at different times in my life, there are three bookcases taking up valuable space (there’s no place for them in the rest of the house) and I have a bad track record with picking paint colors. Instead of getting rid of everything and starting from scratch, I went with the easy changes — paint, accessories and the chi-freeing process of purging and decluttering. The walls started out a dark army green when we first moved in (one of my worst paint choices to date) and then moved to a buttery yellow. I loved the individual colors at first, but after about four years of each, they grew tired. I’m not sure how I came up with my most recent color, Benjamin Moore cucumber, but I absolutely love it. It reminds me of the pistachio custard at the Dairy Godmother. It’s a calm and soothing color, has an almost vintage quality, and remains pretty consistent throughout different times of the day. 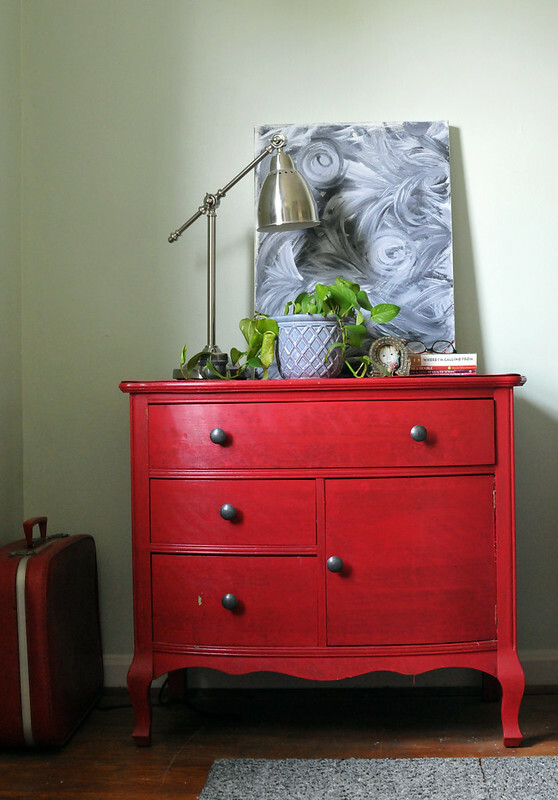 My nightstand (and small clothes storage) is a red cabinet I purchased at Potomac West a while ago with the intention of painting. I haven’t decided if I will paint it or not, but for now I kind of like the way it doesn’t match, a bright pop of color against all the other neutrals. 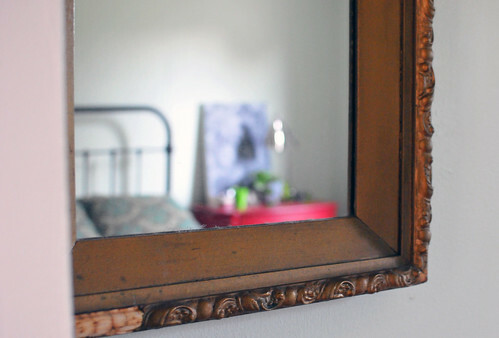 I also found this gold mirror at the Not Too Shabby moving sale to replace a standard issue dorm-style wall mirror. Part of the decorative trim has broken off and I’m planning to spray-paint the whole thing gold to mask the blemish. In addition to the three white bookcases, there are three more shelves of books above my husband’s dresser, with a few pictures and personal mementos mixed in. 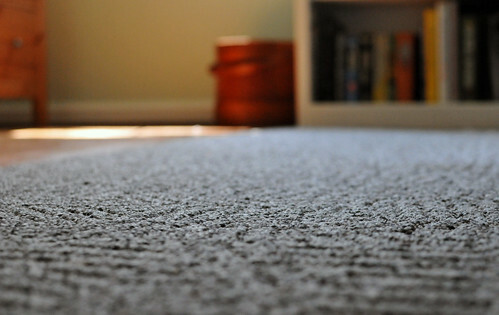 I replaced a multi-color rug with simple grey carpet tiles, the same ones I have in my living room. 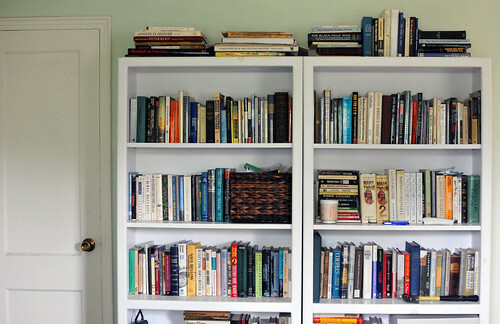 I like how the grey rug and comforter blend with the white bookcases and green walls. The room is still a work in progress. All the trim could use a fresh coat of white paint and I have a few additional pieces of art for the walls. I haven’t yet decided what to do with the windows — curtains or blinds? — but for now I’m fine with the clean minimalist look. I’m happy just a few simple changes could have such a big impact. Do you have a room you’re working on? Would you be interested in sharing it on this site? Email us at info[at]diydelray.com. For the carpet tiles – did you use FLOR? I’m thinking of using that instead of an area rug in our living room and would love to know what you thought or what you actually used. 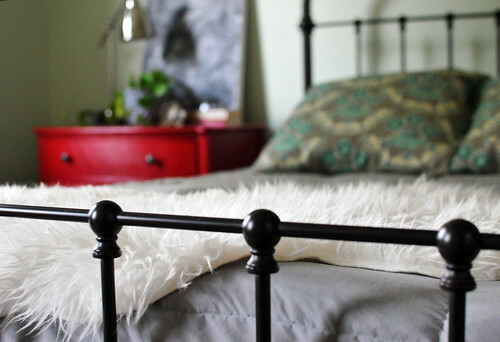 Room looks great – I love the red nightstand! Yes, they are Flor tiles. These are called Mind Map. I like the nubby texture because it helps hide dirt and they are easy to clean. We’ve used Flor tiles in almost every room in our house – definitely recommend them! If you sign up for their emails you can get special deals – I saved 25% on these which helped offset the shipping. You can also order samples before you make a decision. Good luck! Let me know if you use them! Thanks! I think there is also a store in Georgetown if I’m feeling brave enough to deal with the crowds. I love the room and agree the red dresser is great. I also love your bed frame and the shelves above your husband’s dresser, where did you find them? Thanks Laura! 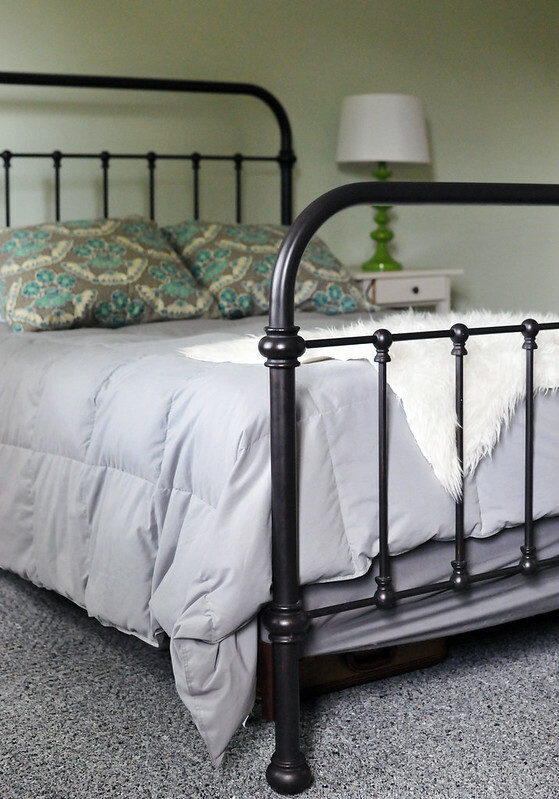 I got the bed frame from Restoration Hardware about 9 years ago. 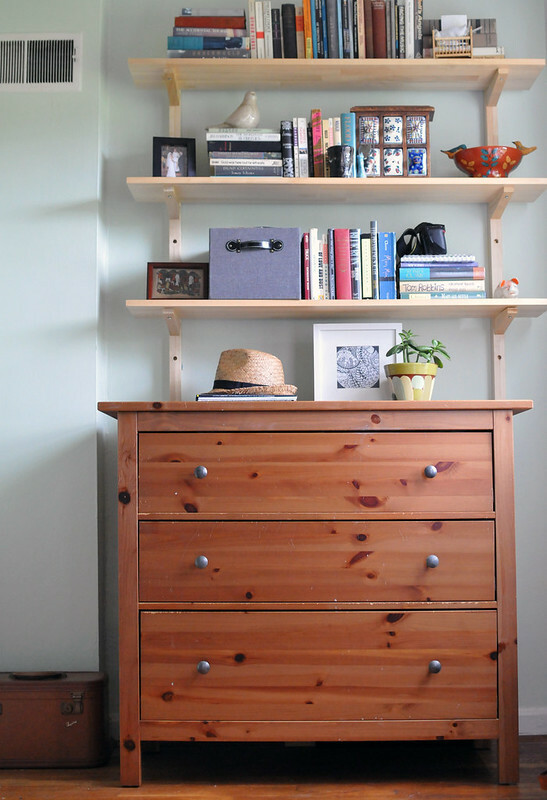 The shelves and dresser are from IKEA. A friend and neighbor has desperately been trying to find the right pale green color for her bedroom and the color you chose is it. I cannot wait to show her your post! Great – I hope she likes it!